Tickets for this event are available at the Cinema Arts Center on the day of the performance. Prices are $8 for FMSH and Cinema Arts Centre Members / $12 for Non Members. There are no advance tickets for this event. The concert begins promptly at 7:30 PM and there will be NO OPEN MIC tonight. Long Island-based guitarist and singer-songwriter Bob Westcott is certainly no stranger to local audiences. He began his career as a teenager in the basket houses of Greenwich Village, and has been perfecting his elegant finger-style guitar work for decades. Bob was one of the first members of the Wes Houston Band, and has been called “the real deal” by noted folk-scene author Robbie Wolliver. He has performed throughout the New York metropolitan area and across the country, as well as in Canada and the UK. 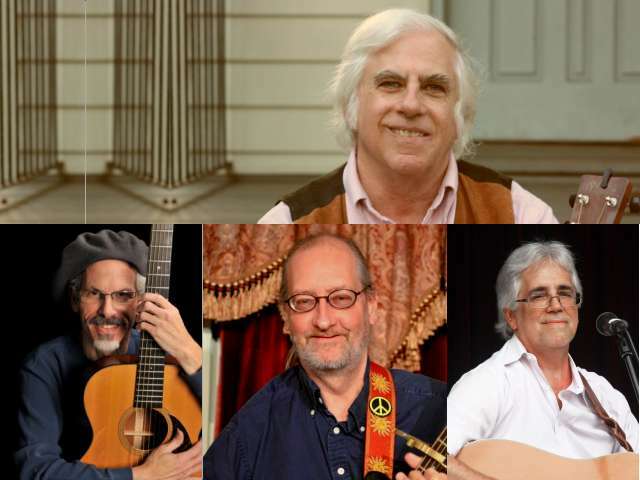 Ray Lambiase is a veteran LI-based singer-songwriter whose contemporary style borrows from both country and folk traditions. He has performed extensively throughout New York and has had songwriting contracts with both Nashville’s Combine Music and Bob Dylan’s Special Rider Music. His latest CD, Time Leaves Things Behind, features 11 of his original songs. Bill Lauter is a Huntington-based singer and guitarist whose striking vocal interpretations of both traditional and popular material have made him a long-time favorite at acoustic music venues and libraries on LI. Bill’s warm, rich baritone voice has an impressive range and a strikingly pure sound, which is enhanced by his highly-refined guitar work. His repertoire ranges from spirituals, blues and gospel songs to Celtic and contemporary material and standards — some of which are featured on his CD, Brand New Day. Patchogue-based singer-songwriter Hank Stone was born and raised in New York City, where he began playing guitar and writing songs as a teenager. After moving to LI during the 1980s and raising a family, he returned to performing as a classic “late bloomer,” first hitting the local stages in 2001 with original songs reflecting his wide-ranging musical tastes and offering a smorgasbord of narratives, character studies, and mood pieces. Hank has performed across LI both as a solo artist and in several bands. He released a solo CD entitled Until I Saw that Train last year. Joining Hank will be Todd Evans on guitar and vocals, Gary Settoducato on drums, and Bob Westcott on bass.